Driving by the Satellite (ex-Spaceland for all you old timers, ex-Dreams of LA for all you even older timers) this past weekend I saw the food truck out front. Gotta have a food truck out front nowadays. 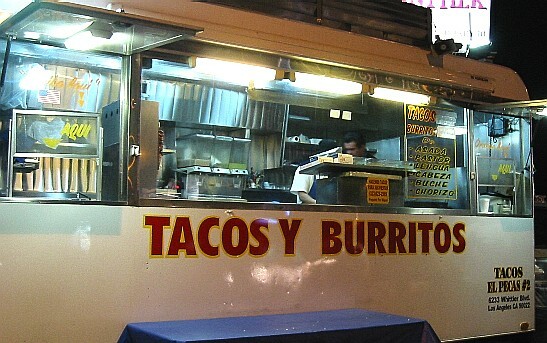 It’s no burrito wagon I said out loud. Not in Silver Lake. The truck bore a digital sign. The name came across. Wait a minute, “Pinche Flavor”? Love it! I said let’s stop. My wife said why. I said I wanted to get a burrito at Pinche Flavor. She pointed out the sign said Pinch of Flavor. Oh. You should wear your glasses she said. Then I realized I can’t remember the last time I heard anyone say pinche anything in this neighborhood. We kept driving. The pinche hipsters were lining up for their Korean fusion vegan whatevers, and I hate lines anyway. This entry was posted in Eats and tagged food truck. Bookmark the permalink.